I've bought myself two 250 Watt "micro" grid-tie inverters (SUN-250G) direct from the manufacturer Ningbo National Hi-Tech Park Sunshine Technology in China. They cost US$72 each plus US$85 for international courier, which converted to NZ$313.59 or $157 each. (They quoted US$60 to ship one.) It took them 4 weeks to get the shipment ready(!? ), and 4 days in transit to arrive on my doorstep. They're just a wee bit bigger than an A5 sheet of paper. On Sunday I connected the first one up to two 80 Watt 12 volt panels connected series which provide about 38 volts with no load. 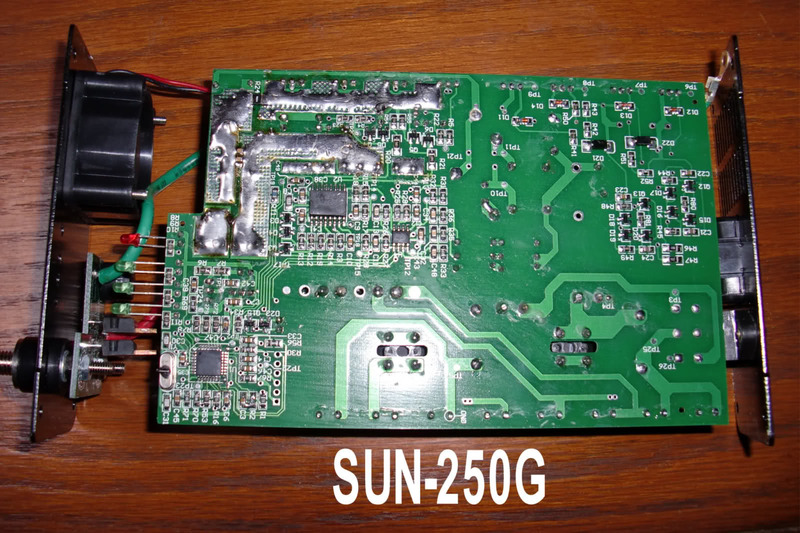 The model I bought can accept an input of 22-60 volts DC. Then I plugged it in to the mains and it's LEDs indicated it was feeding power back in to the grid. It was late afternoon on an overcast day so I wasn't getting a lot of power - but at least it works. Given that we're in mid-winter here I won't be seeing significant power from it for several months. I'll connect up my energy meter when the sun comes out to see what power is being generated. Now I'm saving up to buy more solar panels to drive the second one. Email me if you have any questions/comments. One of my two units has stopped working. Given all the that this is a very low cost inverter I'm not that surprised. Having seen all the videos above I thought it was quite possible I'd have problems. The red fault light is on and there is no power being output. I've opened up the unit to see if there are any obvious burnt areas and to sniff for any burnt areas. Nothing obvious. Tomorrow night I should have enough time to pull the board out of the heat sink case and measure the main msfets and diode for any direct short (as per this video How to repair a Power Jack 3000W Inverter). I've opened up the unit and found one of the diodes was dead. So I've ordered a couple of replacements (RHRP8120 Hyperfast diode, 8A, 1.2KV TO-220AC) from Element 14. The diodes arrived yesterday and I've replaced the dead one. It's back up and running fine. The unit that I repaired last month seems to stop working in the hottest part of the day (it's mid-summer here). When I touch the outside of the box I can feel it is a little hotter than my other unit. I'm guessing it is overheating and shutting down. It seems to self recover after it's cooled down a bit. So I've made a couple of hacks to address that. 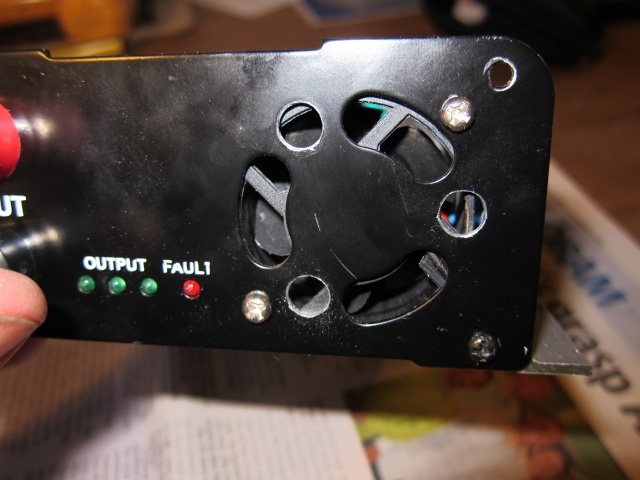 I drilled some extra holes to reduce the obstruction at the fan "mouth". The end panel that the fan is mounted on is fairly strong steel so I might go back and cut out all the metal in front of the fan mouth. This looks pretty ugly but was fast, easy and cheap. I'm aware the heatsinks are not in the optimum location (the hot IC's are affixed to the sides of the box) but this was the easiest way to mount them, with the least amount of fiddling inside the box. I'm hoping they're so big they do the job of cooling the chips enough for the inverter to function on hot days. 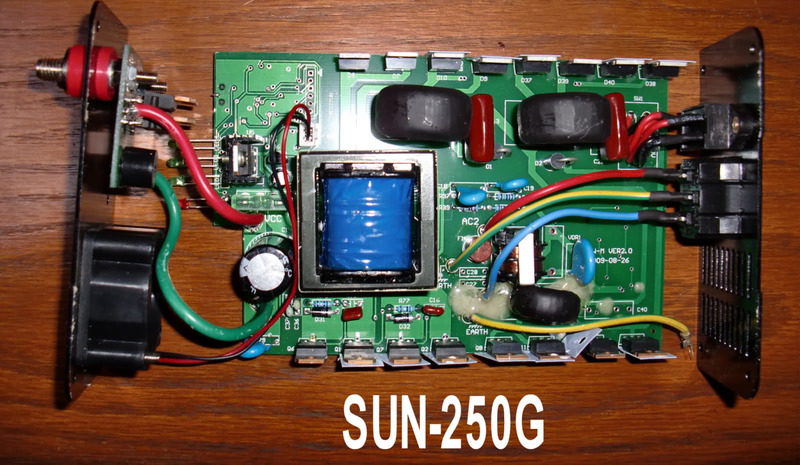 I bought two SUN-500G units (500Watt, 22-60V). 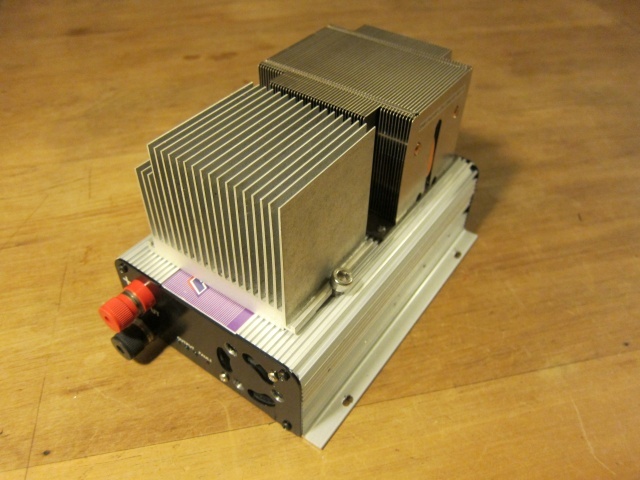 The 300W unit died in 2014. 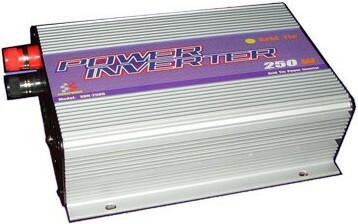 The two 500 W units have been going well - but I only drive them at a maximum of 250 Watts. For these cheap units I think it's best to assume the actual reliable capability is about half the stated rating.